New Orleans’ bonafides as a party city are certainly tough to beat, but for a metropolis that boasts such a rich drinking culture, it can be surprisingly tough to locate reliably delicious spots for the kind of late, late night eating that’s a must after a long evening. Sure, you might get lucky and land by chance upon one of NOLA’s somewhat semi-mythical non-restaurant restaurants—“Dude, I swear that 24-hour gas station that serves the city’s best shrimp po’ boy is around here somewhere.” But we thought we’d take some of the guesswork out of your 2 am hunger pangs with this guide to some of the Big Easy’s best late-night restaurants. From boudin balls to impressively authentic Cubanos, you’ll sate all your cravings here. 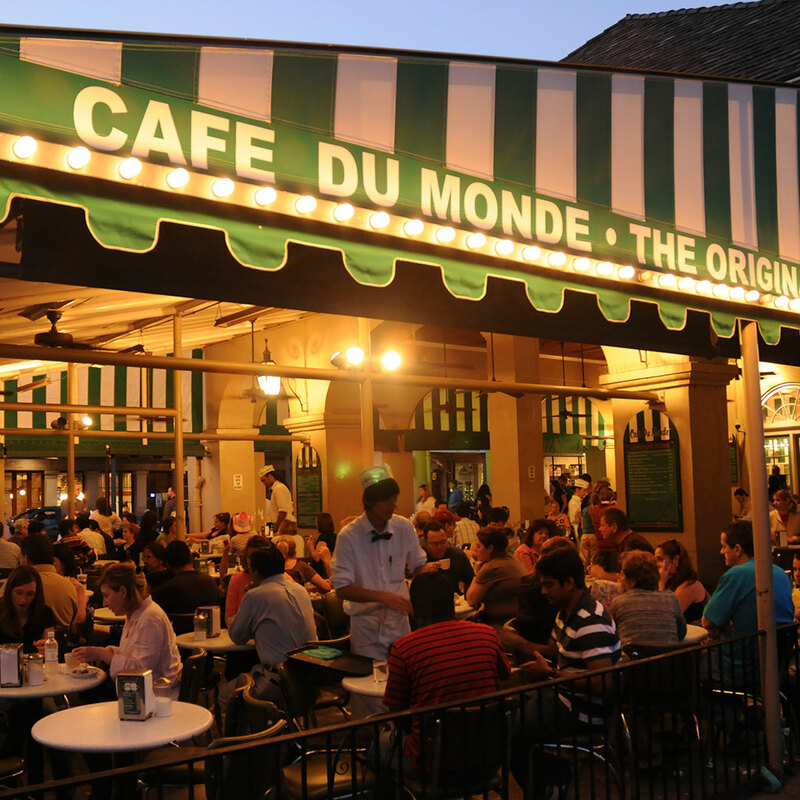 Anyone who’s lived in New Orleans, visited New Orleans or even thought of visiting New Orleans knows about Cafe du Monde, the famed beignet-fryer and chicory coffee-slinger established in the Quarter in 1862. During the day, it can be kind of an ordeal to get a table at the original Decatur Street location, but luckily for late-night munchers it’s open 24 hours and a breeze to get in at, say, 4 am. Cafe du Monde’s pillowy, hot-from-the-fryer French-style doughnuts—which, in spite of the chain’s wild popularity, remain unimpeachably delicious—hit the spot in the wee hours. If you need some steam to keep the party going, the coffee is hot, robust and smooth. This bi-level dive bar is known throughout the Marigny and the Quarter for its raucous late night atmosphere—last call isn’t until 3:45 am on weekdays, 4:45 on weekends. The upstairs bar—where the revelers flock—often turns into a dance party. Take a break from dancing with Mimi’s excellent tapas plates, available until 2 during the week and 4 on weekends, and attractively priced between $5-$9. The manchego toast, loaded with creamy sautéed mushrooms is a must, as are the tender griddled lamb chops. Open 24-7, this corner deli and grocery in the middle of French Quarter festivities has been a NOLA staple since 1968. Its excellent (and huge) po’ boys have kept late-night partiers sated for decades. And VM’s most popular sandwich, the All That Jazz, might sound like a head-scratcher but it tastes like an everything-but-the-kitchen-sink dream: Swiss and American cheese, ham, turkey and tomatoes layered onto New Orleans-style French bread piled with sautéed shrimp and mushrooms, is drunk-food heaven. Already collapsed in your hotel room with a growling stomach? Verti Marte delivers its hot food—and beers—as well! Attracting jazz fans and Cajun food lovers alike for more than six decades, this neighborhood-straddling lounge—its slogan is “On the border of the Quarter since 1939”—is a welcoming, down-home environment. Open 24 hours a day, it’s a worthy stop on your nighttime itinerary. Settle into a booth, grab a Bloody or some beers, and get some bar bites: think deep-fried gator or boudin balls doused in crawfish cream sauce, loaded cheeseburgers. The sleeper hit of the menu, fried green beans that taste like a cross between onion rings and fries, might even convince your that they are healthy. Open until 2 am nightly, this French Quarter spot resembles a handsome sports bar, with crimson exposed brick walls, a long bar and plenty of flatscreens. But the Saint Lawrence’s bro-ey atmosphere belies real strength in the kitchen. Priding itself on using fresh, local ingredients, the restaurant has seriously elevated bar fare. In place of crunchy rings, calamari comes Nicoise-style, sauteed with olives, tomatoes and fennel and accompanied by grilled French bread. Chicken wings are confited in their own fat, not deep-fried. And for those looking for something a bit less complicated, the house fried chicken is exemplary, juicy and crunchy in equal measure. A NOLA newcomer, this bright and cheery Cuban cafe has kept NOLA denizens in rum and Cubanos since its spring 2015 opening. A sliver of a bi-level space, El Libre charms with white walls, neon pink stools and a lazily spinning palm-frond ceiling fan. Keep the party going on Friday and Saturday nights when staff serve up excellent cocktails like mojitos, a curacao-spiked El Presidente, and, of course, a classic Hemingway daiquiri. And make sure to stay for the textbook Cubano sandwiches that are crisp and buttery, layered with tender roast pork, ham, Swiss, pickles and mustard. As a “proto-Tiki” establishment, C&T’s drinks feature rum, fresh fruit juices and Caribbean spices, all in remarkable balance with one another. Check out the impressive Cane Street Swizzle, a Falernum-laced beauty served in a hollowed-out pineapple. Then soften the alcoholic impact with wildly creative, Caribbean-informed plates like crispy rum ribs, a massive portion of fried Duroc pork ribs encased in a feather-light batter, then glazed in a sweet-spicy mix of Guyanese rum, papaya chutney and sambal oelek. This Uptown gem is a true New Orleans landmark, established on South Carrollton in 1946 and serving up diner classics like massive breakfast omelets, frosty milkshakes and particularly beloved slices of chocolate-pecan pie. The Grill reaches peak attendance at weekend brunch, when diners take in the open-kitchen action from a unique counter that snakes around the restaurant, providing a tantalizing view, but it’s also a worthy late-night spot on Fridays and Saturdays, when patrons can linger until 2 am. Order a burger and some fries and decide whether to end your evening—or head back out into the New Orleans night. Expertly prepared Egyptian food, sparkling with fresh tomatoes, lemon and parsley, isn’t the first cuisine that comes to mind when you think “New Orleans,” but that’s what makes Cleo’s so special. Tucked, improbably, into a small CBD general store, the tiny kitchen turns out fragrant grilled meats, greaseless falafel and delicately wrapped grapes leaves. And for those looking something a bit heavier in the wee hours Cleo’s boasts excellent shawarma, fragrant kibbe and tender braised lamb shank.